Members say cheaper airport extension option would provide service that is nearly as good as original plan for elevated track. 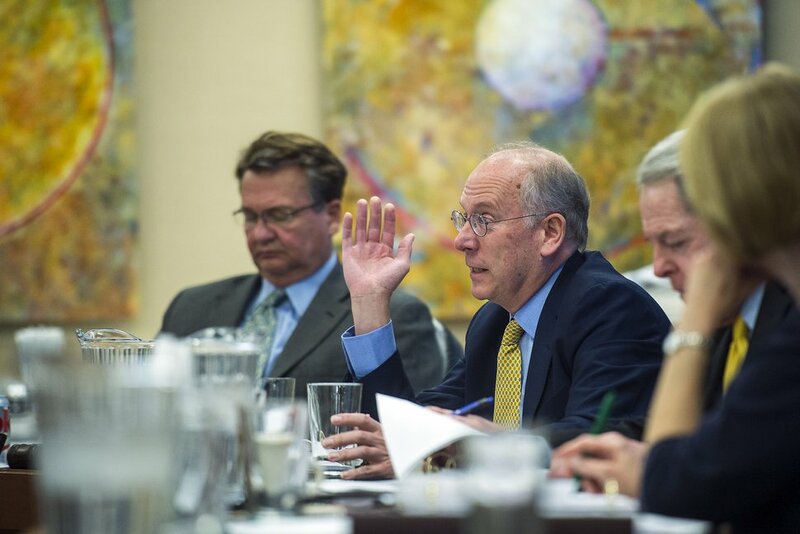 (Chris Detrick | The Salt Lake Tribune) Airport Advisory Board Chair J.T. Martin speaks during a meeting at the Salt Lake City International Airport Wednesday, September 20, 2017. Salt Lake City Airport Advisory Board members voiced support Wednesday for a street-level extension of TRAX light-rail service to a new airport terminal — which would shave tens of millions from a long-proposed elevated-track option. The board was told that refinements to the new proposal will give passengers an experience that is almost as good as the expensive elevated track and station, and would cost $15 million instead of about $68 million. “I was hellbent for leather that we use that original plan,” said board Chairman J.T. Martin, figuring it was essential to the new $3 billion airport expansion. He said he’s changed his mind now after seeing refinements. “At the end of the day, I think it does provide an excellent level of service,” he said. The street-level alternative would deliver passengers 150 feet from the entrance of the new terminal. A canopy would cover that short walk. Passengers would take an elevator or escalator to go up one level to ticket counters and security. Airport engineering director Kevin Robins said that elevator/escalator ride — which sometimes is cumbersome with luggage — “is really the only difference” in experience between the more expensive option where an elevated track would deliver passengers into a parking garage at the same level as new ticket counters. (Chris Detrick | The Salt Lake Tribune) Kevin Robins, Director of Engineering, SLCDA, speaks during a meeting at the Salt Lake City International Airport Wednesday, September 20, 2017. “We think this is a very comparable level of service,” Robins told the board, and many members voiced agreement. The board took no votes on the option. Also, earlier discussion of the street-level option had indicated that TRAX service to the airport might be suspended for six to 18 months for construction after the new terminal opens. (Courtesy of Salt Lake City International Airport) An aerial view of the planned rebuild at Salt Lake City International Airport. The current airport light-rail stop can be seen at the southern tip of the existing airport (the white crescent-shaped buildings), and a new proposal would simply have the train turn left (west) and stop 150 feet short of the new terminal, on the building's east side. The width of the train line would push a neighboring loading road about 25 feet farther north, leading to a tighter entry and exit for planes at gates northeast of the new terminal building. In light gray, this map shows the light-rail proposal favored until recently by city and transit planners: an elevated track that veers west across airport access roads to the southeast of the parking area and then again westward into the "Gateway Center," represented here as a large blue rectangle north of the parking garage. Passengers would be able to check in and check their bags at the center before walking across a skybridge into the terminal. Robins, however, said engineers now believe sections of new track could be constructed in such a way that the rail line would open at the same time as the new terminal and require suspension of service for no more than a handful of days — about the same time disruption as the more expensive elevated-track option. Robins also said space is available inside the terminal near the TRAX station to create an area where passengers from arriving flights could buy train tickets and wait in comfort. 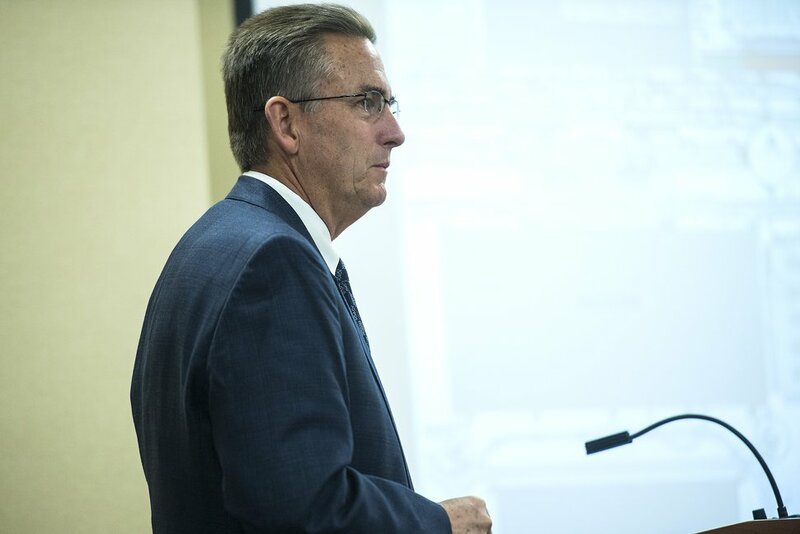 Interim airport Director Russ Pack said Mayor Jackie Biskupski asked airport officials to try to come up with a cheaper, workable alternative because the Utah Transit Authority had trouble affording the more expensive option. 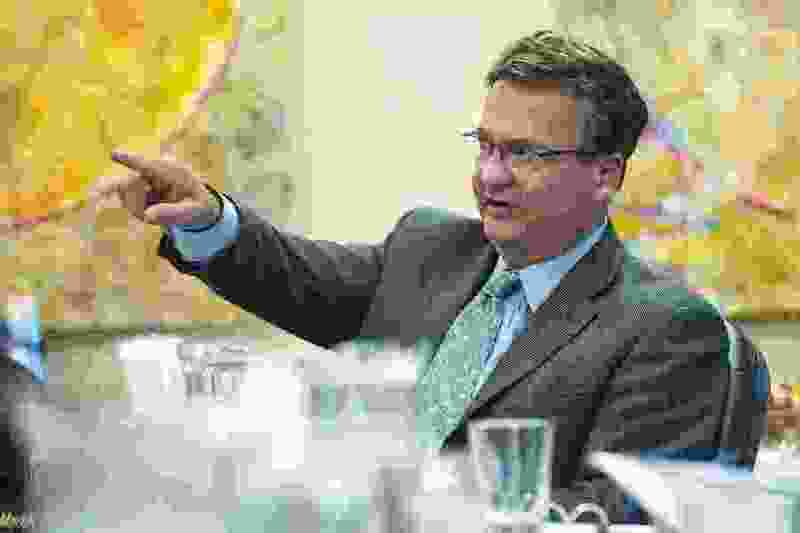 (Chris Detrick | The Salt Lake Tribune) Airport Advisory Board member Igor Best-Devereux speaks during a meeting at the Salt Lake City International Airport Wednesday, September 20, 2017. The UTA Board is scheduled to discuss the airport TRAX extension next Wednesday, and possibly approve proceeding with the new option. Pack noted that engineers earlier proposed the elevated track believing that a street-level extension would interfere with the ability of large wide-body airplanes to taxi into new gates nearby. But engineers found ways to preserve that ability, although it would require some tricky maneuvering by large airplanes into some gates, he said. The problem was largely resolved by Delta Airlines deciding to take those gates with plans to use them mostly for smaller jets that more easily may maneuver into them, Pack said.